alaTest ha raccolto ed analizzato 60 recensioni su Tesco Ladyshave. La media della valutazione per questo prodotto è 4.2/5, confrontata con la media della valutazione di 4.3/5 per altri prodotti. Abbiamo analizzato differenti valutazioni di esperti ed utenti, età del prodotto ed altri elementi. A confronto con altri prodotti, Tesco Ladyshave ha ottenuto un alaScore™ complessivo di 86/100 = qualità Molto buono. Very pleased. Cheapest shaver I could find. Quick and easy to use. Does a good job. What more is there to say ? I bought it not knowing exactly what to expect when it comes to its quality but was pleasently surprised. The end result is quite smooth. Wasn't expecting much as this shaver was SO cheap but it does exactly what I need it to do & seems sturdy enough. Bought this a couple of weeks ago and am happy with the product. It does what it's supposed to do and at a very good price. 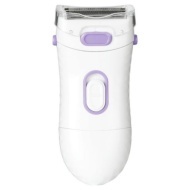 Why pay more for this kind of a product......it's a shaver, and it shaves! I bought this for my 1st lady shave. After looking at the expensive ones i decided to buy this & i'm so glad i did.\nNice & light, extremely well priced & does a good job & only a fiver to boot!